Every home is unique and because our services are customized to suit each family’s needs, our house cleaning rates vary from home to home. 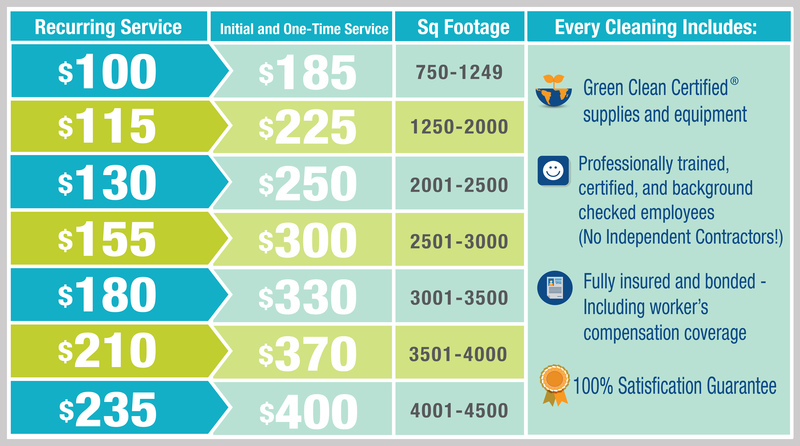 But we know you'd like to get an idea of what it might cost to clean your home so we've provided a handy chart below based on square footage. These are estimates only and other factors may affect your pricing such as the number of people and pets, and how often you want your home cleaned. Give us a call and we will be happy to provide you with a more accurate estimate based on your needs. We look forward to hearing from you! Recurring service rate is based on average bi-weekly service. Sales tax applies. Whatever your cleaning needs, we've got you covered!